Nick and Ben Ginster are one of many Milwaukee small business success stories. The two brothers started Fyxation Bicycle Company in 2009 and today their Milwaukee designed bikes can be found around the world. The Fyxation brand, featuring durable and stylish urban-focused tires, is known and respected throughout the international bicycle community. 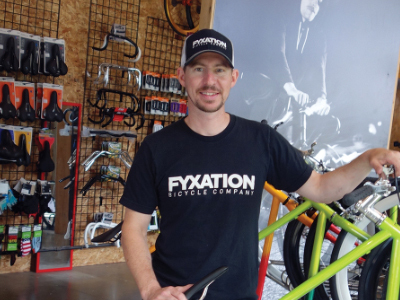 Locally, Fyxation bikes are sold at the company’s retail space in the heart of Riverwest. venture, Next Session, LLC, with the help of an LRC loan secured through the federal New Markets Tax Credit program offered by the Wisconsin Housing and Economic Development Authority (WHEDA). Along with financing, LRC also offered technical assistance. The brothers are happy to be back in Silver City, now as owners of the same building where they leased their first space. working space for entrepreneurs, startups, remote employees or individuals looking for a collaborative working environment. The Fyxation retail store in Riverwest will remain open. Learn more about Nick and Ben Ginster’s businesses at fyxation.com and pedalmilwaukee.com.